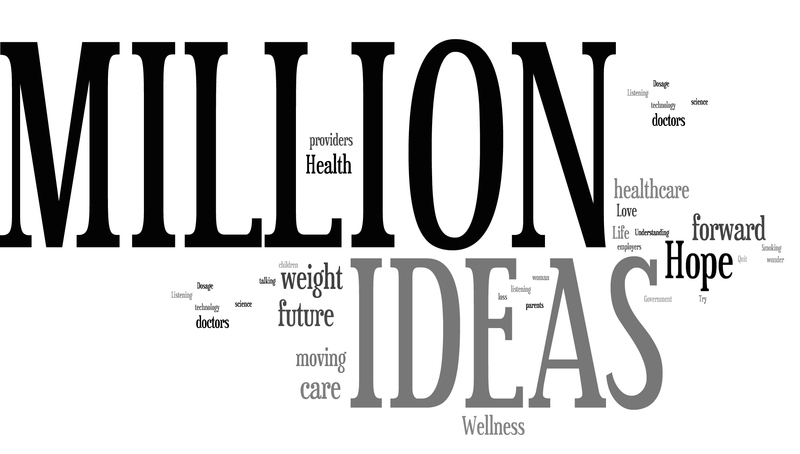 We started this blog for one reason; to listen and share ideas that can improve health. So far, we’ve talked about community outreach, healthcare, and just about every wellness topic under the sun. But without a doubt, the most meaningful ideas have come from you, and we’re asking for more. Thanks to your comments on blog posts and the “Share Your Ideas” forum (top left), we’ve been able to listen to your feedback, complaints, and ideas to improve healthcare. Using those comments, we’ve created content, performed research, and used them to change the way we interact with our communities. We absolutely appreciate every comment we’ve received, and we encourage you to read what other’s have already contributed. So please, if you have an idea for improving health, healthcare, or the communities in which we live, share it! Or, if you want us to blog about a certain topic, we’d love to hear it. If there’s a new fitness fad or hot recipe, pass it on and we’ll give it a whirl. If there’s something irking you about healthcare, tell us, and we’ll talk about it. Let us know what you want us to blog about, and we’ll do our best to create content that is meaningful to you. Click on the Share Your Ideas tab above, and let yourself be heard. We’re always listening. Broccoli vs. Green Beans: Thanks to the fact that green beans smell like a burning dumpster, this was a pretty easy call. Broccoli is also considered a super food, so it ranks higher on taste, nutritional value, and perhaps most importantly, smell. Broccoli wins in a landslide. Asparagus vs. Cucumber: This was neck and neck. Both are crisp, refreshing, and have that “snap” factor that I love. I’ve always been a fan of cucumbers on sandwiches, but a cucumber on its own doesn’t match the flavor of asparagus. Tough call, but asparagus takes the battle. 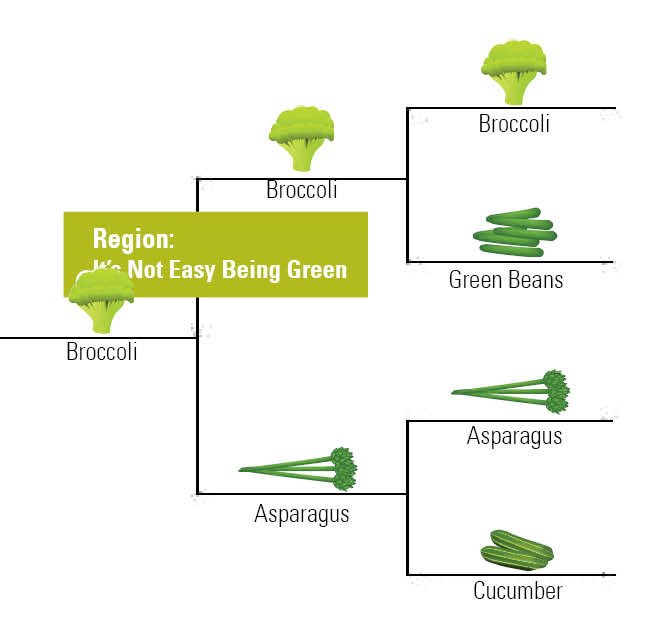 Broccoli vs. Asparagus: The “It’s not Easy Being Green” region is by far the most competitive region in my bracket, and it showed with this bout. Both are delicious, easy to prepare, and loaded with nutrition. But according to most nutritionists, broccoli is the healthier of the two. Since flavor and texture are a wash, broccoli takes the region. Last region, a bunch of vegetables that don’t belong in any category, the “Veggie Nomad” region. Cauliflower vs. Squash: Pretty lame battle here. Cauliflower is essentially broccoli’s loser cousin, and squash tastes like nothing. I’ll be honest, I hated both, but since cauliflower is part of the cruciferous vegetable family (aka, super veggies), I knew it was better for me. Cauliflower wins by healthy default. Peas vs. Corn: Is corn even a vegetable? I grew up thinking it was, but I also thought Jurassic Park was a documentary, so my childhood judgement was a little flawed. Luckily, it’s a moot point, because I opted for sugar snap peas, which are absolutely delicious. This fight was over before it started, peas for sure. Cauliflower vs. Peas: Lets see, I can choose cauliflower which tastes like a wooden piece of broccoli, or peas, which are scrumptious…hmm, I think I’ll take the peas. It’s embarrassing that cauliflower was even in this match-up. 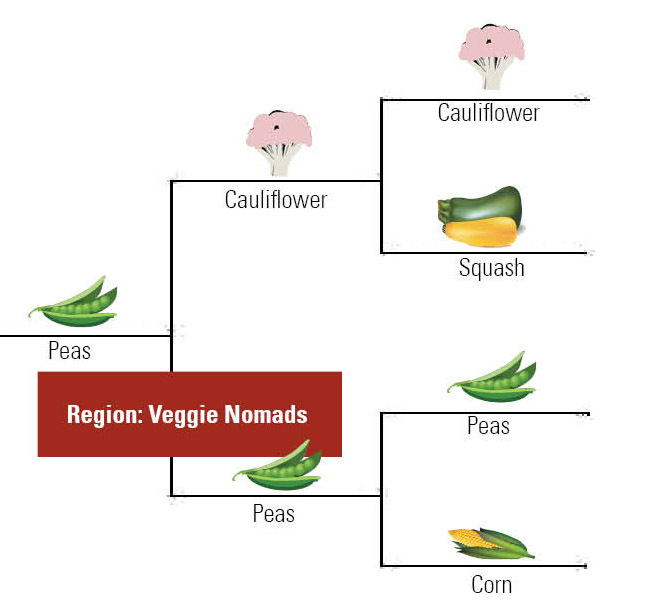 Peas wins the “Veggie Nomad” region. That leaves me with a final four of carrots, romaine lettuce, broccoli, and peas. It’s safe to say that these were the #1 seeds of the bracket. In keeping with the March Madness theme, I’ll post the champ later this week! In the meantime, feel free to weigh in if you think I’ve lost my mind with my picks! 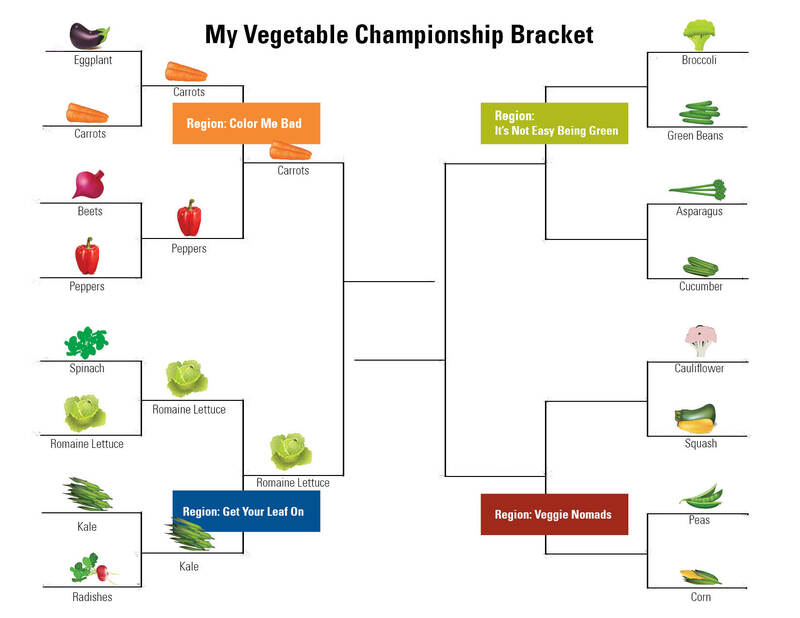 And of course, check out the first post and download your own veggie bracket. Unfortunately, eating healthfully and eating cheap don’t always go hand-in-hand. But nutrition is a vital piece of living a healthy life, and a new idea has started to surface to promote healthier shopping; cash back on healthy food. This week, NPR published an article titled, Cash Back on Broccoli: Health Insurers Nudge Shoppers To Be Well. 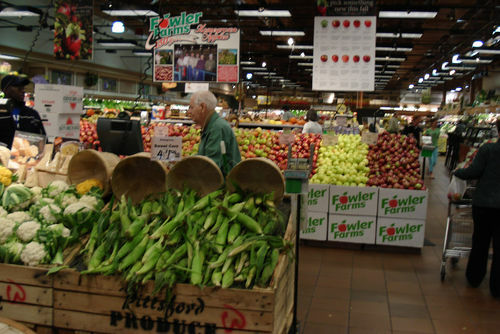 The article is about an innovative partnership between a health plan and a grocer. In this case, Wal-Mart (grocer) teamed with HumanaVitality (health plan) to offer rebates on foods that were labeled “Great for You.” For this partnership, the “Great for You” rebate was 5%, and it applied only to HumanaVitality members that shopped at Wal-Mart. The idea has been successful in other countries (South Africa has shown that this idea supports healthier shopping habits), but the HumanaVitality/Wal-Mart partnership is the first of its kind in the US. The idea sounds great, but the verdict is still out on whether or not it’s making an impact on shopping habits. So we wondered, would a 5% kickback be enough to change the way you shopped? And, besides grocers, who could health plans team up with to provide incentives for healthier living? We’d love for you to weigh in.